Way back in 2013 Joanne Begiato, Steven Gray, Isaac Land and I wrote a blog post called The six best conference questions: Or, how not to paper-bomb at a conference. 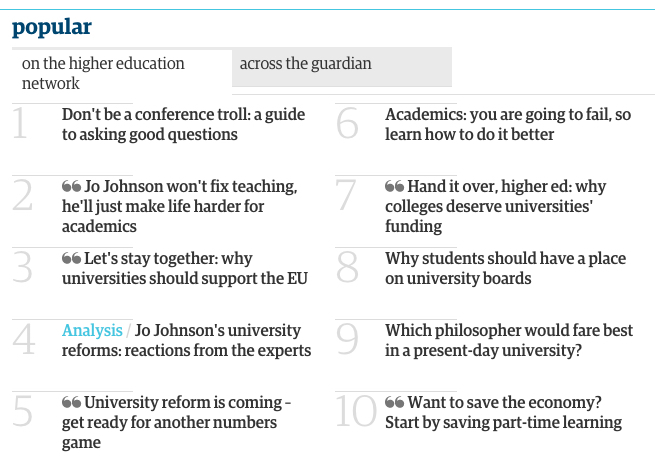 The piece was intended to be an encouraging response to a rather entertaining article written by Allan Johnson in Time Higher Education about the six questions every academic dreads to hear at conferences. That post turned out to be by far and away the most popular post ever to appear on this blog and it’s now found a new lease of life in The Guardian. 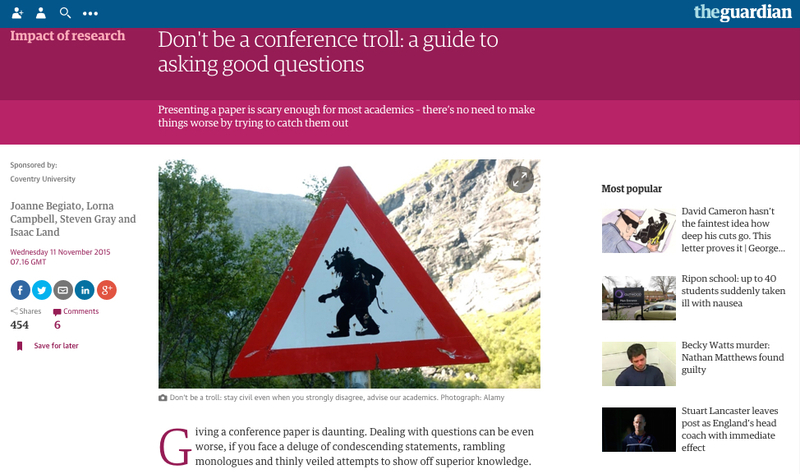 Earlier today The Guardian Higher Education Network re-published our piece under the title Don’t be a conference troll: a guide to asking good questions. We’ve had an overwhelming response to the article on twitter so it seems like this piece is still striking a chord with colleagues across the sector. Many thanks to Steven for suggesting we submit this to The Guardian! This entry was posted in higher education, history and tagged higher education, history, writing. Bookmark the permalink. ← Is there a Library shaped black hole in the web? Event summary.